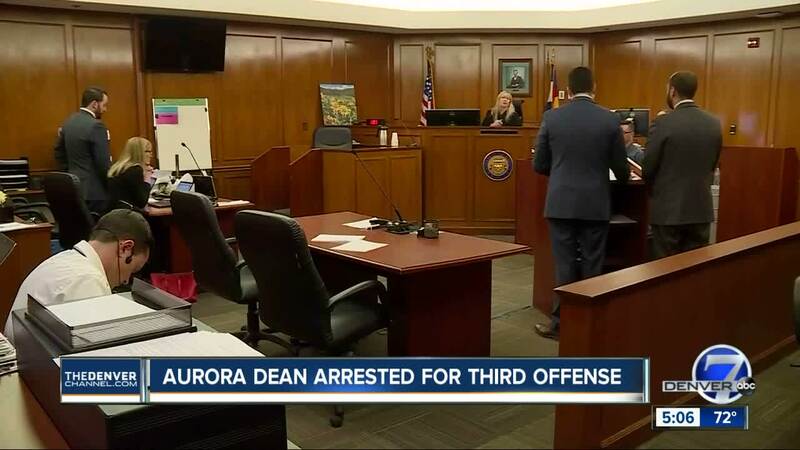 ARAPAHOE COUNTY, Colo. – The dean at Aurora West College Preparatory Academy arrested for a third time in two weeks on Friday was formally charged Monday with three felonies and a misdemeanor in regard to gun threats he is accused of making at the school earlier this month. He left the office and allegedly took pictures of different parts of the school and texted them to Teslolikhina, who placed the school on lockdown. According to his arrest affidavit, Rae admitted to sending text messages that day “that he should not have sent,” but the police documents do not make clear what the content of those messages was. Rae was arrested later that day at his home in Denver on suspicion of felony menacing and interference with school staff charges. But he posted a $25,000 bond, after which the Aurora Police Department sent officers to the school and the homes of school staff to ensure their safety. He would be re-arrested the next day in Denver and held on a $200,000 bond on suspicion of felony menacing and false imprisonment charges. The original case was dropped when Rae made his first court appearance April 10 on the latter charges. That case was merged into the case heard in court Monday, according to the district attorney's office. Rae posted the $200,000 bond in the case after his court appearance that day but was arrested again on Friday on suspicion of felony menacing and false imprisonment charges – charges for which he appeared in court on Sunday and posted a $75,000 bond ahead of Monday’s hearing. Teslolikhina was placed on administrative leave sometime after the incident, Aurora Public Schools spokesperson Corey Christiansen told Denver7 last week. In the third case out of Denver, Rae has been ordered by a judge to relinquish his firearms and has seen a protection order issued. His second advisement in that case is set for May 1. An affidavit for his arrest in the case says Rae threatened the victim in the case with the same gun he is accused of using to make threats at the school. According to the documents, Rae and the victim, whose name is redacted in the documents, came back to Rae's house after a work function. The two were co-workers, the documents say. Rae was "feeling sad for himself," the victim told police, and the victim asked to leave his home. But Rae allegedly grabbed a handgun, pointed it at her, then allegedly fired on bullet just to the side of the victim. The woman said she "did not report the incident because she didn't want Rae to get in trouble ... and that she didn't want Rae to commit suicide," according to the documents. He had previously discussed suicide with the victim, the police records state. They also say that the victim stopped by Rae's home again on March 7, and when she again tried to leave, he blocked her from doing so and at one point grabbed her arm and threw her down on a couch. The two argued until the victim called 911, the documents state. Rae’s preliminary hearing in the Arapahoe County case was set for June 10 after Monday’s hearing. As conditions of his bond, Rae will be monitored via GPS and will have to report to pre-trial services in conjunction with his Denver case.